I have started making homemade yogurt, and I usually keep two types at the same time. One is a lactobacillicus bulgaricus strain, the other is a bifidus strain. They taste differently and look exactly the same - so I usually want to know which one I am taking out of the fridge, but can't tell by looking. I make the yogurt in small jars meant for home canning, and they only come in a single color. Unlike jam, the turnaround time is short, I only make 6 jars per batch of any type, and eat at least one of each type per day. So I want something which survives washing the jars (so not paper labels). I also don't want to make permanent marks on my jars. I have been thinking to start putting something foodsafe in each jar such that it is visible from the outside, but don't have ideas of what this thing should be. What is a practical and aesthetically pleasing solution for distinguishing the yogurt types? Some permanent markers (sharpies for example) can take multiple passes through the dishwasher while still being legible, but a quick wipe with alcohol of any kind will take it off. For truly permanent marking on glass, engraving is the way to go. A vibrating engraver is more precise and more expensive than a rotary tool (dremel or cheap equivalent), but the latter is perfectly fine and makes wider lines. The downside is that this isn't particularly visible against a white background such as yoghurt unless you go over it with marker. Simply twisting a bit of coloured wire around the clip might do the trick. Plastic stickers (widely available aimed at children) can survive being washed many times as evidenced by my daughter's water bottles, but you're a bit restricted as to design - is one yoghurt a good match to pirates and the other better for princesses? Having marks that are both temporary and durable is a tough combination, because something that can survive a dishwasher will by definition be hard to remove. Good answers already provided, but I personally prefer the flexibility of being able to label each container however I want every time I use it, to avoid having to keep track of separate types of containers. I generally use a grease pencil, AKA china marker. They are specifically meant for marking glass and china. They are available in various colors. The markings are easily removed, and will not survive a dishwasher, but would probably survive gentle hand washing. Despite the name they are actually wax-based, not grease-based and are safe for use in the kitchen. One other advantage of grease pencils is that they can write on a wet surface, which is great when you've got a cold container with condensation on it. Here's a blog post with a couple of examples of grease pencil use. Apparently writing your name on your wine glass at a party is a thing to do now. Personally, I tend to use "permanent" markers: Once you run the jars through a dishwasher, they usually disappear. Nail polish is a bit more permanent and suitable for colour-coding and writing (at least single letters or symbols). Grandma used it to mark the kids' personal drinking glasses and on the bottom, it keeps well, even in the disheasher. The sides are a bit more exposed to the spray, but should withstand a few dozen cycles nevertheless. Easy to remove and redo, if necessary. Stencils come handy, too (re-usable, self-adhesive ones, for example). For a more "crafty" approach, have you considered Window Color / fake stained glass paint? Probably not something you want to keep on the jars while they incubate, but as a reusable peel-off label, you could get multiple uses out of each. Store on a plastic sheet protector when not in use. You need not get as detailed as I did here. 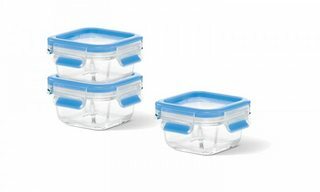 Replacement jar seals of different colors, colored rubber band, or when you switch to the square containers, different colored lids. Alternately, a circle of parchment or wax paper on the surface of your yogurt. 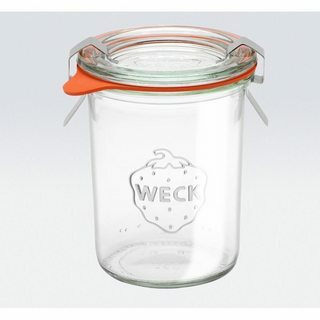 Weck also has a white plastic lid (see Amazon) that you could place on jars you want to distinguish. See also this storage cap. ...and this. As I understand your question, you want temporary labels. Write your temporary label with pen or marker on clear tape. Fold one end under slightly to make a tab for easy removal. I use this method to mark the date on glass containers of left overs. Easy to grab the folded end and rip the tape off after eating the contents. Or, perhaps you could use different food colorings to distinguish between the types of yogurt. Not the answer you're looking for? Browse other questions tagged storage yogurt or ask your own question. How can I know when my yogurt is ready (in a generic, basic, non-us yogurt maker)? How to prep a #5 plastic container for making yogurt? How to catch culture out of yogurt? Do you need to sterilize jars when making yogurt?